Hi! Today I have some nail art for you. I recently participated in a weekly challenge in the Facebook fan group for Rainbow Connection. The theme was 'monochrome with a pop of colour', and was inspired by Glisten & Glow. I really liked how my mani came out, so I thought I'd write a quick post and share it with you. Read on for more info! 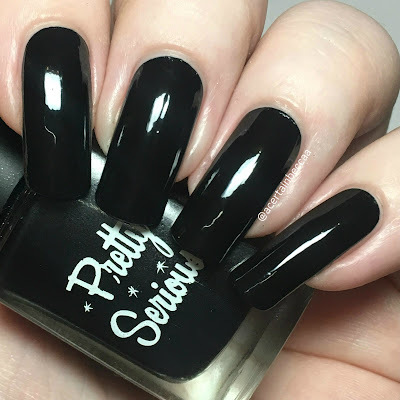 I started off with a base of Pretty Serious Cosmetics 'Absence', my go-to one coater black. My bottle is actually starting to get pretty low, so I'll need a back up soon! 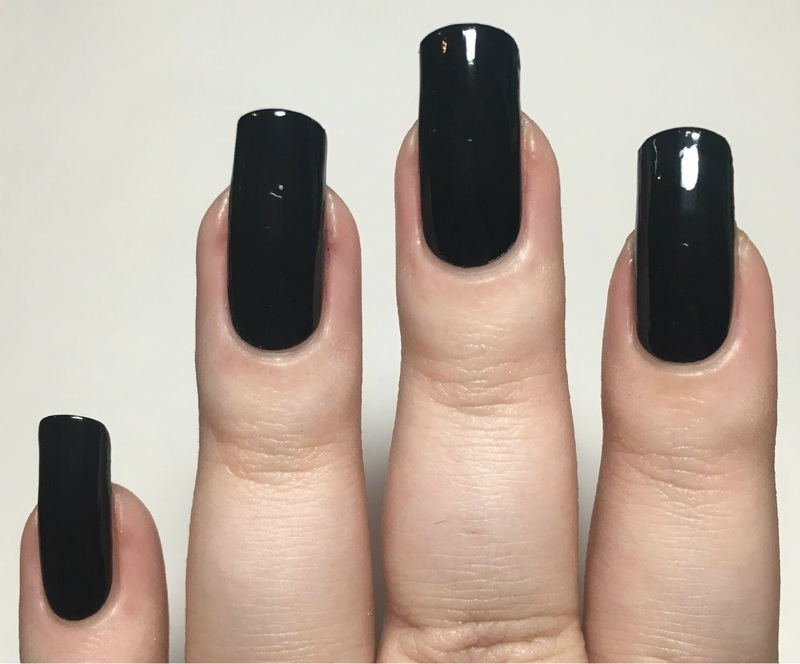 The picture below is without topcoat. 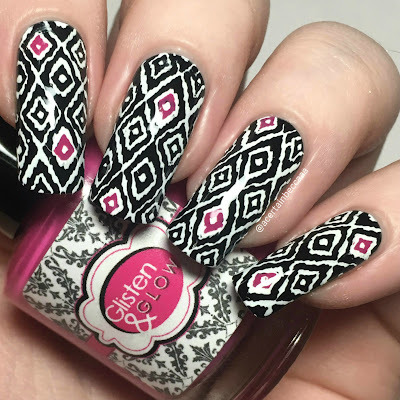 For my stamping, I used the sort of sketched tile pattern from Creative Shop plate 20. 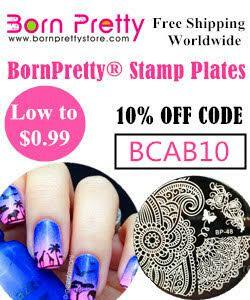 I stamped using Hit The Bottle 'Snowed In. I coloured in a few random parts of the pattern for my 'pop of colour'. As the theme was originally inspired by Glisten & Glow, I thought it was fitting that I used a Glisten & Glow polish. I went for 'ATV in Aruba' to match the pink on the brand logo. I finished with topcoat. What do you think? I actually think these came out pretty cool. 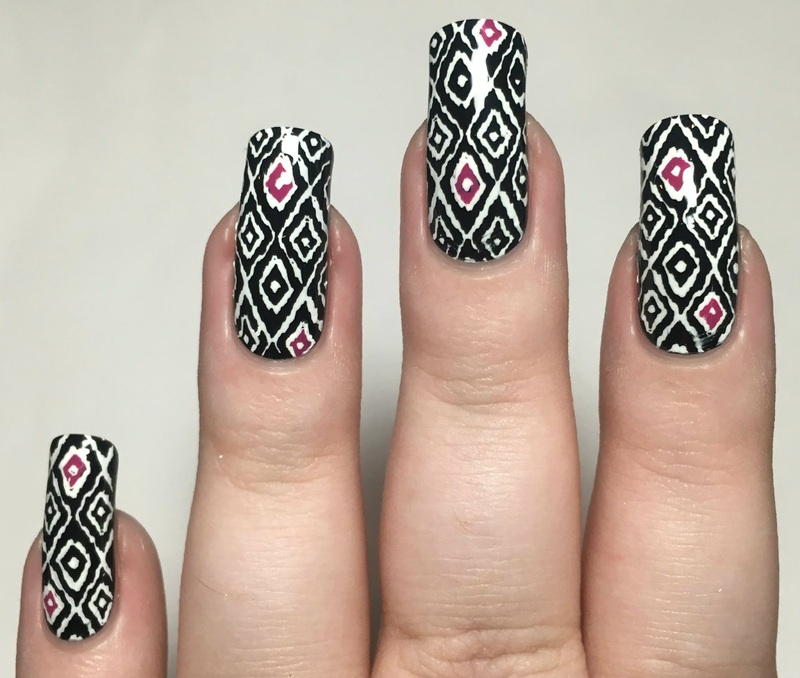 It was another spur of the moment mani - they always seem to come out the best! For some reason I feel like this would be a good pattern for dinnerware, or maybe even a dress. Is that just me? All of the brands mentioned can be found over on Rainbow Connection here.